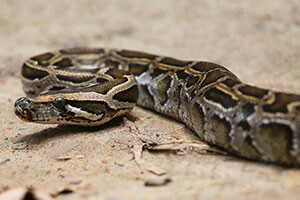 At this point, pythons are notoriously known to be bad news for the Everglades. They are an invasive species as they deplete mammal populations. Each year, pythons hunts are held to reduce the number of this species in the Everglades to try and help bring balance back to the ecosystem of the Everglades. Now, researchers are saying the Burmese pythons are eating/killing so many animals in the Everglades that mosquitos are starting to bite the hispid cotton rat that carries a virus that is dangerous to humans. This rat carries the Everglades virus, which is an encephalitis-causing pathogen. The hispid cotton rat’s virus can give a person a fever, headache, and encephalitis, which is inflammation of the brain (in rare cases). A University of Florida research Nathan Burkett-Cadena said mosquitos are now biting this rat more than any other mammal living in the Everglades. The hispid cotton rats multiply fast, and since the Burmese python is depleting other mammals, the rat has become a main source of blood for the mosquitos to feast on. In the past, mosquitos could frequently bite deer, rabbits, racoons, and other mammals, but their numbers are shrinking in the Everglades. There is a specific mosquito that is biting the rats; it’s called the Culex cedecei. Thankfully, this mosquito doesn’t go into urban areas, so it’s rare that humans will contract this virus. However, the Culex panocosa mosquito does go into cities, but has yet to bite the cotton rats. The University of Florida research team is keeping an eye on the mosquitos to see what is happening with these mosquitos and rats. When visiting the Everglades, it’s always extremely important to cover up (long pants, long sleeves) or wear insect repellant. Even if there is no virus present, the Everglades is a living ecosystem where thousands of insects thrive, so it makes sense to protect oneself to keep bugs from biting. The answer to restoring the wildlife and mosquito-biting balance in the Everglades lies in the reduction/eradication of the pythons. To get a permit to hunt for pythons, click here. To explore the beautiful Everglades, click here or call 800-368-0065. Captain Mitch’s Airboat Tours show you the Everglades like you will never see it in any other way! Crawling all over the Everglades’ trees and floors are reptiles. More than 50 distinct kinds of reptiles live in the Park. The Park’s most well-known reptiles are, of course, the American alligator and the American crocodile, but there’s plenty of other scaly creatures running around, including the very tiny green anole (anolis carolinensis). The green anole is native to Florida. In fact, this anole is the only native anole in the United States. The anole is found in warm, humid climate, so mostly in southeast United States. This tiny lizard can change from brown to green as it blends and camouflages to its surroundings. They can change colors in mere seconds. They are known to change colors when under stress, also. They have a red throat pouch, as well. When the male anoles, lift their heads and make their red pouches protrude, they are either attracting a mate or marking their territory to other male anoles. These green anoles only grow to a maximum length of 8 inches. Both male and females have oversized toes for traction; they have adhesive toe paid and claws, which also make climbing easy. They have a long snout, slender body, and have a lightly patterned coloration on their backs and tails. They are known to aggressively defend their territories. Their mating season is between April and July. The females can lay one egg each week throughout the four month mating season. It takes the eggs 35-40 days to hatch. Baby anoles have to defend themselves, after hatching. The green anoles eat insects, spiders, and moths; they swallow their prey whole. The anole’s lifespan is around 5 years. Green anoles can be found on trees and all habitats around the Everglades. They are also a common house pet. Green anoles have been studied a lot to help with scientific research to help understand other behaviors in animals, as well as neurological disorders and drug delivery systems and biochemical pathways in regard to human illnesses. Want to spot a green anole in the wild? You may get your chance on an Everglades airboat tour. Come out today and experience the magic of the Everglades with Captain Mitch’s Airboat Tours. To book an airboat ride, click here or call 800-368-0065. Animals. Insects. Reptiles. Amphibians. Plants. Water. Airboats. These are a list of things that you may easily see on your trip to the Everglades. However, did you know you can also see artwork in the middle of this beautiful wetland? It’s true. 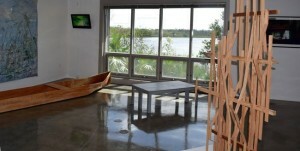 On a visit to the Ernest F. Coe Visitor Center in the Everglades, you can have the chance to see AIRIE NEST, which is an interdisciplinary art gallery put on display by AIRIE, Inc (Artists in Residence in Everglades). The space recently had renovations completed through a Knights Arts Challenge grant; there are large picture windows, polished concrete floors, and new white walls surrounding the art. Until January 15, the exhibit “About Florida Bay” will be up for viewing. This exhibit is artists’ response to the ecological changes that have altered the ecosystem of Florida Bay. Water was rerouted, to support agricultural needs in the state, so the water no longer flows into the Bay, which has severely changed the ecosystem and wildlife. Nine artists came together to create work for this exhibit; the goal of their work was to capture the historical significance of this area, while also raising concerns about the future of this place due to current environmental dilemmas. The artists featured include: Houston Cypress, Mark Dion, Valerie George, Nick Gilmore, Jason Hedges, Valerie LeBlanc, Daniel H. Dugas, Nathaniel Sandler, and Magnus Sodamin. Deborah Mitchell, artist and Executive Director, AIRIE, Inc. About Florida Bay, is curating the exhibit. On December 17, there is a Sundays in the Park artists talk and piano recital from 1 to 3 p.m.
AIRIE Nest Gallery is located at Everglades National Park’s Coe Visitor Center, 40001 State Hwy 9336, Homestead, FL. The gallery is open daily from 8 am to 5 pm, free of charge. Before or after visiting this wonderful exhibit, explore the Everglades by airboat on a ride with Captain Mitch. 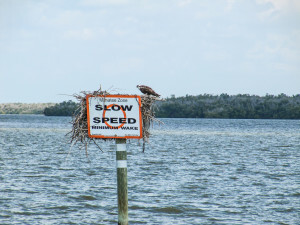 Captain Mitch’s Airboat Tours give you a glimpse of the Everglades like no other. To book an airboat ride, click here or call 800-368-0065. Love to fish? The Everglades is a great spot to do it, since one-third of this place is covered by water! Throughout the park, there are many acres of shallow water flats, mangrove keys, and channels that make great spots to fish! However, fishing from the shore is limited. In the state of Florida, there are specific freshwater and saltwater licenses and regulations to follow. For important fishing information, click here. One type of fish that is plentiful in the waters of the Everglades is the spotted sea trout. For this article, we wanted to share with you some basic information on this fish that makes the Everglades, amongst other places, its home. Also, it is a pretty tasty fish for you to bring home and cook up! Sea trout, also known as Cynoscion nebulosus, can be found inshore and in deep waters up to 33 feet deep. They are dark gray or green on the top part of their bodies with blue/white/silver colorings underneath. They have black spots on their back, dorsal fin, and tail, but have no scales on their soft dorsal fin. Sea trout have one to two prominent canine teeth at the front of their upper jaw. They feed on shrimp, crabs, mullet, pinfish, and baitfish. Their spawning season is between March and November. They swim in small schools and don’t stray too far from the estuaries that they were born in. If you’re looking to catch a sea trout and you do, it’s important to return them to the water immediately if you don’t plan on keeping them to bring home. They are a delicate fish and can be easily harmed. The biggest sea trout ever caught in Florida was 17 pounds, 7 ounces and it was caught in Ft. Pierce. On average, most sea trout an angler will come across will weigh around 4 pounds but they can easily get up to 15 pounds in weight. Like stated above, there are specific regulations when it comes to catching different species of fish in Florida’s state waters. With sea trout, you can catch them and keep them if they are between 15 and 20 inches in length; the daily bag limit of sea trout in Florida waters is 4 fish per angler. 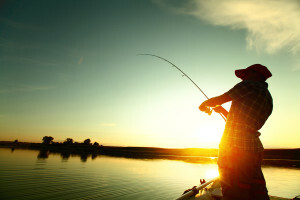 In Florida, spotted sea trout fishing is permitted throughout the entire year. Fishing for sea trout is legal, if they are caught with a hook and line or a cast net. If fishing isn’t your thing, but you like being on a water, then an airboat ride may be the right kind of trip for you in the Everglades. Captain Mitch’s Airboat tours brings guests all over the Everglades for spectacular views as you make fun memories. To book an airboat tour, click here or call 800-368-0065. When you think of wildlife in the Everglades, what comes to mind? Alligators? Panthers? Majestic birds? How about insects? Well, they should, because there’s thousands of them flying and crawling around this ecosystem. One such insect that calls the Everglades home is the lubber grasshopper. Lubber grasshoppers are one of the largest grasshoppers, so they can be easy to spot while walking on a trail in the Everglades. They are also slow moving, which also makes it easy for you to catch a glimpse of them. They can grow up to four inches in size. 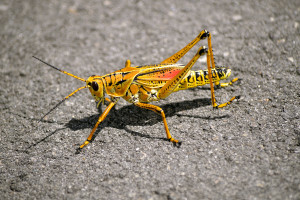 This type of grasshopper is brightly colored and patterned. They are bright orange, yellow, and red. They have wings, but they are flightless. They can, however, jump short distances. Because of their bright colors, they cannot camouflage themselves well into the green scenery of the Everglades, but their bright colors can be used as a warning to animals not to eat them because of toxicity. In fact, many small mammals and birds can and have become sick from ingesting this grasshopper and learn to not try and taste it again. Because they are toxic, this grasshopper really has no need to move fast. If this grasshopper feels threatened or is picked up, it will make a loud hissing noise and secrete a foul-smelling foaming spray to irritate its predator. Lubber grasshoppers eat broadleaf plants, and are known to be a garden pest.They can be found in grasslands or oak woods. They eat leaves of citrus plants, vegetables and ornamental plants. They are known to be a problem when they swarm residential areas and destroy (by eating) plants in gardens. Unfortunately, these grasshoppers aren’t really affected by most insecticides, so the best ways to get rid of them is to hand pick them off plants, stamp on them, or drown them in soapy water. There are different types of lubbers including: Eastern lubbers, horse lubbers, flightless plain lubbers, and southeastern lubbers. Each type has different jumping abilities and vary a bit in coloring and size. During breeding season, lubbers lay around 25 to 50 eggs. These eggs are underground during the winter and hatch between March and June. After they hatch, the young grasshoppers will molt their exoskeletons five times every 2 weeks before becoming an adult. Want to spot this creature on a ride through the Everglades? Explore regions of the Everglades you haven’t seen before on a ride with Captain Mitch’s Airboat Tours. 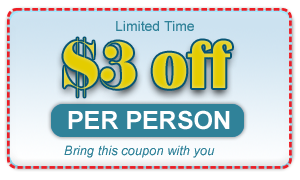 Click here or call 800-368-0065 to book a trip today. At certain times of the year, the Everglades can look like a scene out of Alfred Hitchock’s The Birds. Thousands of birds flock down to this warm climate to spend the winter and breed. For this article, we wanted to spotlight one species of bird that can be found in the Everglades: the Limpkin. This bird can actually be found in the Everglades year-round. Limpkins are notoriously known to be noisy. In fact, you may have a better chance of hearing a limpkin than seeing one. Limpkins begin to make sounds at dusk and continue all through the night until dawn. Their cries aren’t sweet, usually they are loud screams, which are unmistakable. This bird is related to rails and cranes. It’s a brown bird with white spots and streaks along its body. They have long necks, legs, and bills. Their long bills help them easily remove apple snails from their shells; apple snails are the main food source of the limpkin. Their bills, when closed, have a gap at the end that acts like tweezers. You can usually find the limpkin around areas where apple snails are abundant, but if apple snails are not easily found, the limpkin will eat other types of snails, freshwater mussels, insects, frogs, crustaceans, lizards, and worms. 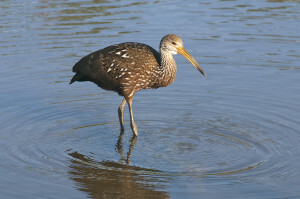 You can find limpkins mainly around shallow bodies of water; they are a slow-moving bird with a high-stepping gait. The “limp” in limpkin comes from this gait that often gives off the appearance that the bird is limping even though it is not. Limpkins stick with their own kind and do not mix in with other wading birds. While nesting in the Everglades or other parts of Florida, they build their nests on top of floating vegetation, as well as high tree limbs. They can lay 3 to 8 eggs at a time. Florida is actually as far north as this bird goes. Limpkins can be found throughout the Caribbean, Central America, and South America. Limpkins range from 25-28 inches in height with a wingspan of 39 to 42 inches in width. Limpkins are not endangered or under watch, but at one point, their numbers were dwindling in Florida due to human development. Want to have the chance to see (but most likely hear) this bird up close? Come out on an airboat tour to glide around the limpkin’s habitat. Captain Mitch’s Airboat Tours are a great way to explore all the ins and outs of this wetland. To book an airboat tour, click here or call 800-368-0065. One of the most overlooked aspects of Mother Nature can be found right overhead. Look, up there in the sky! Clouds can tell us a lot about the coming weather, and when you’re out in the Everglades, it’s important to know if a storm is on its way. 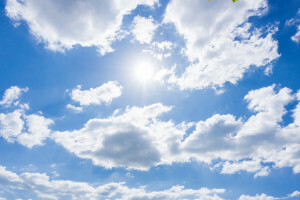 The movement of clouds can tell you the direction that a change in weather is originating from. Here are a few cloud types to be familiar with. –Cirrus: High-flying cirrus clouds, usually above 18,000 feet, look like delicate strands or tufts of hair, or a wispy patchwork of cloud fingers. Cirrus clouds hold ice crystals, and they’re often cast by yellow or red hues just before sunrise and just after sunset. They’re often fair weather clouds, but when they thicken, it usually means that a warm front is on its way and precipitation is on its way within a day or so. –Cirrocumulus: Like cirrus clouds, cirrocumulus clouds are high-flying and hold ice crystals or super-cooled water droplets — but are often wavy or rippled in appearance. They can even look grainy. Cirrocumulus clouds are a predictor of a coming warm front and possible rain within a day or so; in tropical regions, they’re often a sign that a hurricane is coming. –Altocumulus: These mid-level clouds, between 6,000 to 20,000 feet, have several visual varieties, but those indicating a weather change look like a patch or sheet of irregular clouds (especially if they’re thick or layered). Like cirrus and cirrocumulus, they hold super-cooled water droplets. They may herald that a thunderstorm is approaching quickly; if they’re observed on a humid summer morning, rain should arrive by the afternoon. –Cumulonimbus: Cumulonimbus clouds, which can appear near ground level and up to 50,000 feet, are classic storm clouds. They’re heavy and dense, and look like a looming mountain or tower. Cumulonimbus clouds can produce hail, lightening, and tornadoes. When you see cumulonimbus clouds, it’s time to take cover! Captain Mitch’s Airboat Tours in Everglades City, Florida, is your source for outdoor exploration in the Everglades. To book a tour, visit our website or call 800-368-0065. The Ghost Orchid is one of the Everglades’ most rare and endangered plants. Known in the scientific world as Dendrophylax lindenii, the Ghost Orchid is prized for its delicate, white flower petals. It gets its name from the nocturnal movement of the flower, which resembles a ghost. Ghost Orchids enjoy conservation protection in Florida, and it’s illegal to tamper with or collect them. As of December 2016, it was believed that only about 2,000 plants remained in the wild. Poaching, as well as human development, continues to threaten its existence. 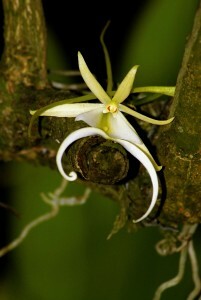 The Ghost Orchid can be found locally in Big Cypress National Preserve, along with more than 30 other types of orchids. Visually, the plant appears as a leafless, tangled mass of green roots hugging the trunk of a host tree. It’s often found in deep swamps of cypress, pond apple, and palm trees, and can be distinguished from other orchid varieties by thin white markings on its root system. The Ghost Orchid requires very specific environmental conditions to grow: high humidity, mild temperatures, shade, and the presence of mycorrhizal fungi. It can also be found in the Bahamas and Cuba, but thrives under a different set of conditions than those in southern Florida. The Ghost Orchid’s flower blooms in June and July, and it’s pollinated by the giant sphinx moth, which typically visits more than one plant in its nightly travels. The sphinx moth’s tongue easily reaches the plant’s pollen; other insects have difficulty getting to it. The popularity of Ghost Orchids grew after Susan Orlean’s 1998 book, “The Orchid Thief,” which was later turned into the 2002 film, “Adaptation.” Researchers at the University of Florida in Gainesville recently developed a way to culture the seeds, grow the plants in greenhouses, and re-introduce them into the wild. Want to go hunting for Ghost Orchids? Captain Mitch’s Airboat Tours in Everglades City, Florida, can show you many of the flora and fauna found in the Everglades. To book a tour, visit our website or call 800-368-0065. The Everglades is a 1.5 million-mile-acre wetland preserve, which means there’s a lot of land and water for you to explore. Being a fragile ecosystem and National Park filled with thousands of creatures and plant life, there are several regulations that must be followed when spending time here. The Everglades provides shelter to many species, and it also provides water to southern Florida, so it is important for visitors to respect this environment. If you’re planning a trip to the Everglades, we wanted to share with you some important regulations to keep in mind. It is prohibited to collect or disturb animals, plants, artifacts, seashells or anything else that is naturally occurring in the Park. Pets are not allowed on backcountry campsites, beaches or in the wilderness of the Everglades. Feeding animals (of any kind) is not allowed. All trash must be taken out of the Park with you or placed in Park’s trash cans. You must bring your own fresh drinking water; it is not available everywhere in the Park. Fires are only allowed at designated beach sites. Firearms and fireworks are prohibited. If you are aboard a vessel in the Everglades, you must abide by the U.S. Coast Guard’s regulations. Personal watercraft, like jet skis, are not allowed in the Park’s waters. If you need tide information, it is available at the Flamingo and Gulf Coast visitor centers, or online. Be extra cautious if your boating by any manatee signs. Generators and other portable motors are not allowed in backcountry campsites. If you need to use a bathroom and are not near any facilities, it is asked that you dig a hole in the ground at least 6 inches deep; the hole should be covered when you’re done. If you’re near a coastal ground site or at a beach, you can urinate directly into the water. Wash dishes and your body away from waterways. These are just some of the Park’s regulations. To view more of the Park’s regulations, visit www.nps.gov. Thinking about heading into the Everglades? There’s so many different ways to explore it, including an airboat tour. A ride on an airboat gives you an up-close-and-personal view of the Everglades; it’s a trip you’ll never forget. To book an airboat trip, contact Captain Mitch’s Airboat Tours at 800-368-0005 or click here. How much do you know about the Everglades? Even though this area is a National Park, the average person may not know a lot of details about this wetland, especially if they do not live near it. In the national news, people are hearing about the Everglades restoration, but may not know a whole lot about the Park itself and its importance to the ecosystem of the area. The Everglades is a truly mystical place, so we wanted to share with you some fun, interesting, and maybe even little-known facts, about it. The Everglades is a slow-moving river. Before mankind moved into southern Florida, the Everglades was a much bigger place. In fact, it was 50 percent bigger, but construction and drainage has caused the Everglades to shrink in size. It used to be around 8 million acres. It is the only place in the world where alligators and crocodiles coexist. Around 7-8 million Florida residents get their water from the Everglades. It is the largest continuous sawgrass prairie in North America. It is a World Heritage, a Biosphere Reserve, and a Wetland of International Significance. 13 endangered species and 10 threatened species live in the Everglades. 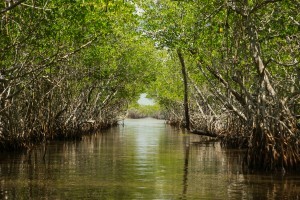 It is home to the Western hemisphere’s largest mangrove ecosystem. It is the largest subtropical wetland ecosystem in North America. The most dominant life form in the Everglades is the periphyton, an algae/microbe that floats on the surface of the water. The first people to inhabit the Everglades were the Calusa Indians around 1000 B.C. Although iconic now, airboats weren’t common in the Everglades until the 1950s. There are no underground springs in the Everglades, but the Floridian Aquifer (reservoir) lies 1,000 feet below. 36 protected species live in the Everglades. It’s certainly interesting to read fun facts about the Everglades, but it’s even more amazing to experience this River of Grass in person. There’s no place like it in the world! An airboat tour through the Park is a great way to take in all the sights, smells, and sounds. To book an airboat trip with Captain Mitch’s Airboat Tours, click here or call 800-368-0065.